Murine models of systemic lupus erythematosus (SLE) have shown apparently contradictory evidence in that either (a) tumor necrosis factor (TNF) expression was low and TNF administration helpful or (b) TNF was high and TNF blockade of therapeutic benefit, depending on the mouse model investigated. In fact, TNF apparently has both effects, checking autoimmunity, at least to some degree, and fostering inflammation. TNF blockade regularly, but transiently, induces or increases autoantibodies to chromatin and to phospholipids. At the same time, open-label data suggest that TNF blockade suppresses inflammatory manifestations of SLE, and long-term benefit was seen in patients with lupus nephritis. A controlled clinical trial is under way. Tumor necrosis factor (TNF) exerts a variety of physiologic and pathogenic effects [1–6]. For example, TNF plays a major role in the organogenesis of the lymphoid system in early development; it has pro-apoptotic and anti-apoptotic effects, depending on the underlying contextual situation; it controls the activation and responsiveness of many cells, including cells of the immune system; and it is a master switch in the initiation and perpetuation of inflammatory responses (Figure 1). 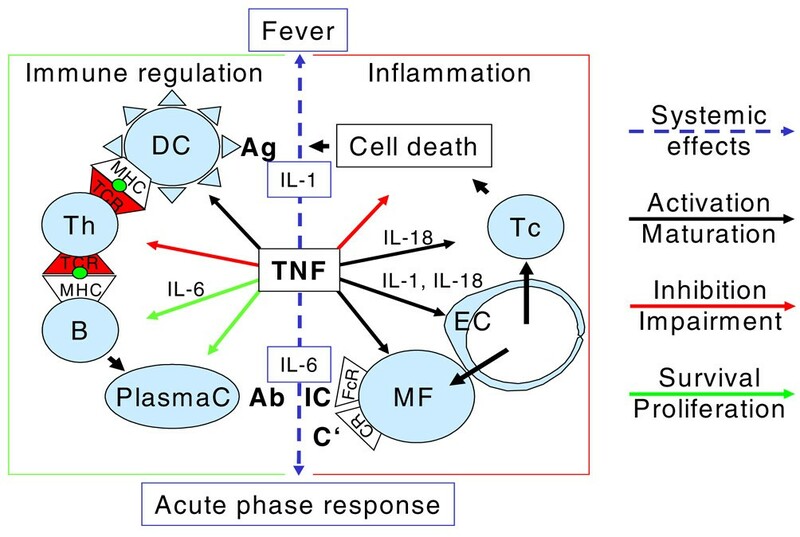 When the role of TNF and TNF inhibition in systemic lupus erythematosus (SLE)–especially the latter two effects–is examined, modulation of the immune (and autoimmune) reactivity and pro-inflammatory effects have to be considered. Therefore, these effects will constitute the focus of the current review. Relevant effects of tumor necrosis factor (TNF). TNF acts on the hypothalamus to induce fever and on hepatocytes to induce an acute-phase response, mainly via interleukin (IL)-1 and IL-6, respectively (blue lines). TNF also exerts a wide variety of immunoregulatory (left) and pro-inflammatory actions: TNF is involved in the maturation of dendritic cells (DC) and activates endothelial cells (EC) and immune cells (black lines). Chronic TNF often is a survival signal (green lines) and plays a role in maintaining survival niches for long-lived plasma cells (PlasmaC). Some of these effects are indirect in part, involving cytokines such as IL-6 for B cells (B) and IL-18 for cytotoxic T cells (Tc). On the other hand, chronic TNF exposure leads to the disassembly of T-cell receptors (TCR), thus inhibiting T-cell responses, and induces the expression of anti-apoptotic proteins, inhibiting programmed cell death (red lines). Effects on many other cells, such as fibroblasts or osteoclasts, were left out because of the focus on immune regulation but are of major importance elsewhere. Ab, antibodies; Ag, antigen; C', complement; CR, complement receptors; FcR, Fc receptor; IC, immune complex; MF, macrophage; MHC, major histocompatibility complex; Th, T helper cell. Autoreactivity is a common feature of healthy individuals, both on the cellular and humoral levels [7, 8]. However, this type of autoimmunity is usually well controlled, is often only transient, and does not lead to disease. In contrast, in autoimmune diseases, autoimmunity has escaped its stringent control and become pathogenic. For SLE, there exist a variety of murine models. They differ in parts of their phenotype and especially in the underlying genetic factors, which lead to their disease. With respect to TNF, it is of particular interest that this cytokine appears to play an immunoregulatory role in lupus-prone animals (Table 1). However, this role is not at all uniform, and TNF has different consequences depending upon the strain and the stage of the disease. In 1988, Jacob and McDevitt  reported that NZB/W mice showed diminished production of TNF, a defect stemming from the otherwise healthy NZW parent, and proved that NZB/W disease was at least partly reversible by administration of recombinant TNF early in life. Gordon and colleagues , upon repeating and expanding these studies, saw similar beneficial effects of high-dose TNF, even after nephritis had developed, but there was no long-term protection against the disease. Gordon and Wofsy  also found that the recombinant TNF had effects on cellular, but not humoral, (auto)immunity. More recently, Kontoyiannis and Kollias , by analyzing TNF-deficient NZB mice, re-established the finding that TNF deficiency is an important driver of lupus-like autoimmunity in certain strains. Whereas TNF-competent NZB mice display a subtle autoimmune phenotype only, TNF-deficient NZB mice developed severe lupus. In contrast to the findings in NZB/W mice, in which the autoimmune consequences of low TNF levels were profound, TNF was found to be highly overexpressed in both sera and renal tissue of MRL/lpr/lpr lupus mice and the levels of TNF correlated with the degree of inflammatory organ disease [13, 14]. Moreover, even in NZB/W mice, there is an increase in renal TNF expression in conjunction with renal inflammation . In fact, anti-TNF therapy was beneficial in MRL/lpr lupus. TNF-targeted approaches improved inflammation in joints  and lungs . Likewise, TNF blockade improved arthritis, pneumonitis, and skin disease of moth-eaten mice  and nephritis and leukopenia in the C3H.SW mouse , two additional lupus models. Of particular interest, administration of low-dose TNF later in the course of NZB/W disease accelerated renal demise , revealing that even in this model, in which TNF was thought to be protective, the cytokine has a dual role–beneficial and detrimental. When therapies that inhibited TNF, such as infliximab, etanercept, and adalimumab, were introduced in patients with rheumatoid arthritis (RA), spondylarthropathies (SpAs), or Crohn disease (CD), the emergence of anti-nuclear antibodies (ANAs) and anti-dsDNA (double-stranded DNA) was observed [20–31]. New-onset ANAs were found in at least one fourth, and up to two thirds, of ANA-negative patients, and this possibly depended somewhat on the disease (Table 2). Autoantibodies to dsDNA, which are much more specific for SLE, still emerged in 9% to 54% of the patients under infliximab therapy, depending on the test system. By means of the Crithidia luciliae immunofluorescence test (CLIFT), Charles and colleagues  found anti-dsDNA in 22 of 156 patients with RA (14%) whereas by radioimmunoassay (RIA) only 8 patients (5%) had clearly positive antibodies (>25 U/mL). aRadioimmunoassay or most conservative value reported; bvalues difficult to reconcile with the number of patients with anti-dsDNA antibodies as measured by radioimmunoassay. ACLA, anti-cardiolipin antibodies; ANA, anti-nuclear antibodies; anti-dsDNA, antibodies to double-stranded DNA; AS, ankylosing spondylitis; CD, Crohn disease; DIL, drug-induced lupus; Ig, immunoglobulin; ND, not determined/reported; RA, rheumatoid arthritis; SpA, spondylarthropathies. It is important to note that the vast majority of these anti-dsDNA antibodies were of immunoglobulin (Ig) M isotype (Table 1) and most probably were non-pathogenic. In contrast to these IgM autoantibodies, the occurrence of IgG anti-dsDNA antibodies appeared to be a relatively rare event. However, these autoantibodies may be closely associated with instances of SLE-like disease [20, 27]. In this regard, it is interesting that, whereas IgM anti-dsDNA autoantibodies were found less frequently under TNF blockade with etanercept , this compound induces lupus to an apparently similar extent as antibodies to TNF . In addition, formation of antiphospholipid antibodies, again mostly of IgM isotype, can occur during TNF-inhibiting therapy [24, 33] and very rarely may lead to life-threatening vascular complications [33, 34]. The induction of lupus-like disease by TNF blockers appears to be quite uncommon, with an incidence of 0.5% to 1% [20, 25, 35], and independent of the type of TNF-blocking drug [32, 36]. Moreover, TNF-blocker-induced lupus is usually benign, with most patients developing fatigue or fever, musculoskeletal or skin symptoms, changes in blood counts, or serositis, but only rarely major organ disease, and these symptoms resolve after TNF blockade is stopped [32, 36]. Nevertheless, seven cases of nephritis occurring under anti-TNF therapy have been reported [37–39]. Four of these cases occurred under etanercept, two on infliximab, and one under adalimumab. Of these seven patients, five treated with etanercept or adalimumab had bona fide lupus nephritis. Histology showed World Health Organization (WHO) class IV (diffuse proliferative) glomerulonephritis in two cases and class III and class V (membranous) nephritis in one case each. One patient did not undergo renal biopsy. Despite these impressive histological findings, none of the five patients had to undergo cyclophosphamide therapy, only one was treated with mycophenolate mofetil (MMF) , and the rest remitted under steroids and TNF blocker withdrawal only. Most clinical manifestations of SLE are the consequence of inflammatory changes subsequent to immune complex formation with Fc receptor and complement activation. In the sera of SLE, in contrast to many other diseases, such as RA, in which the pathogenic role of TNF is established despite the difficulty to readily detect increases in serum levels, TNF reaches levels of more than 100 pg/mL; moreover, TNF concentrations are significantly associated with clinical disease activity [40–44]. Despite the very high serum levels of soluble TNF receptors, which likewise correlate with disease activity [42, 43, 45], the TNF circulating in lupus sera is bioactive . TNF is evidently overexpressed not only in murine (see above), but also in human lupus nephritis [47–50], and our own data suggest that this increase is associated with (renal) disease activity as estimated by histology . In addition, TNF expression was demonstrated in refractory subacute cutaneous lupus erythematosus (SCLE) lesions . Given the role of TNF as a strong mediator of inflammation, the high levels of serum TNF in active SLE, and the overexpression in renal tissue with active nephritis, we reasoned that TNF blockade could be an efficient way to block inflammation in afflicted organs, such as the kidney, the joints, or the skin. However, in view of the autoimmunogenic potential of inhibiting TNF, we tested TNF inhibition as a means to interfere with the inflammatory response in SLE by administering only an induction regime of four infusions of infliximab within 10 weeks rather than by planning for long-term therapy. Before we can embark upon summarizing reports on individual or small groups of cases, a word of caution is mandated. Anecdotal reports or open-label trials cannot be regarded as providing evidence of the results they claim to reflect. If they use some objective measure, the hints they give may be slightly stronger, but the ultimate information has to come from randomized controlled clinical trials . On the other hand, open-label studies in RA , ankylosing spondylitis , and CD were subsequently confirmed by controlled trials. Moreover, the potential risks of the approach and the heterogeneity of SLE with its life-threatening features justified an open-label study as a first step. Finally, open-label experience with TNF blockade in a homogeneous subset of the disease (such as nephritis) with the use of objective laboratory measures (such as levels of creatinine or proteinuria) would allow for focussing a controlled trial once they reveal beneficial effects. From this perspective, we embarked upon an open-label trial several years ago and complemented the data obtained with the anecdotal reports on individual cases that were published in the literature. Although the evidence for therapeutic efficacy of TNF blockade in SLE is still limited, there are a minimum of 28 cases reported at least in abstract form [56–61] and most of these are on the use of the chimeric monoclonal antibody infliximab. Our own experience includes three patients with refractory lupus polyarthritis, all of whom went into complete remission within days after the first (approximately 5 mg/kg) infusion of infliximab . Similar to RA, this effect lasted for about 8 weeks after the last infusion of a series of four. Retreatment was effective for the relapsing disease in a single patient for whom this approach was tried but led to a further increase in anti-dsDNA autoantibodies . All of our patients were on constant dosages of either azathioprine or methotrexate, as were patients successfully treated in Brussels  and Kuwait . In contrast, Katz and colleagues  saw a frequent decline in efficacy and severe infusion reactions in patients who were treated with infliximab without such combination with conventional disease-modifying anti-rheumatic drugs. The published experience on lupus skin disease includes two patients with SCLE [64, 65] who were successfully treated with the combination of infliximab and azathioprine and with etanercept, respectively. We have also seen overt and long-lasting improvement of a butterfly rash following compassionate care treatment with infliximab and azathioprine in a patient with lupus nephritis. Twelve published patients with SLE treated with TNF blockers had lupus nephritis. Among them were seven patients with diffuse proliferative (WHO class IV) [56, 58, 59, 61] and at least four with membranous (WHO class V) lupus nephritis [56, 57, 59]. Most patients were treated with the combination of infliximab with azathioprine or MMF. One pregnant patient received etanercept plus plasmapheresis and intravenous immunoglobulin . In all but three patients, TNF blocker therapy led to significant long-term renal responses. This may easily reflect reporting bias, but in a series of nine patients with lupus nephritis, in which all SLE patients of the cooperating centers were included if they had ever received infliximab, the data still amounted to a success rate of two out of three . It is important to stress an unexpected finding in the patients with lupus nephritis who were successfully treated with only four infusions of infliximab (and constant-dose azathioprine). In lupus arthritis, the disease relapsed within 2 months after the last infusion, whereas in lupus nephritis, the improvement achieved lasted for several years in some of the patients [59, 62]. In fact, many patients further improved their proteinuria over time, with stable normal or slightly improving renal function . These findings, which suggest self-perpetuation of the inflammatory events which is interfered with by TNF blockade, have yet to be understood in detail. It is also noteworthy that severe edema in one case of long-standing nephritic syndrome resolved within 2 weeks despite a much slower increase in serum albumin , suggesting direct effects on vessel permeability . Thus, TNF blockers, and infliximab in particular, appear to rapidly reduce inflammation, and probably also reduce vascular permeability, in patients with inflammatory manifestations of SLE. While dampening inflammation, TNF blockade with infliximab induced an increase of autoantibodies in five out of seven patients and increases in anti-cardiolipin-antibodies (ACLAs) in four out of seven patients in our open-label trial [62, 67]. Moreover, we observed increases in autoantibodies to histones and/or chromatin in all seven patients, including those without anti-dsDNA antibodies . At least in part, the increase in anti-histone and anti-chromatin antibodies preceded the anti-dsDNA increase. All of these antibodies were only transiently elevated and fell back to baseline levels shortly after TNF blockade was stopped. None of the patients experienced a lupus flare, and serum complement levels remained stable [62, 67]. Nevertheless, the induced antibodies to dsDNA were of high affinity, as measured by RIA, and of IgG isotype, as determined by CLIFT. Although this could have been expected given the preformed anti-dsDNA antibodies, the absence of lupus flares requires clarification. Several explanations are possible. First, at the time of inclusion into this study, some patients may have had a non-pathogenic autoantibody profile, which, even when activated and expanded, remained non-pathogenic. Second, the increase in autoantibody levels was only transient, whereas the longer-term presence of high levels of pathogenic antibodies might be required to induce complement activation and flares; such a notion is supported by observations on the long-term presence of anti-dsDNA antibodies before the onset of SLE symptoms . Third, the pronounced anti-inflammatory effects of infliximab may have prevented damage despite the presence of potentially pathogenic antibodies. Nevertheless, we have observed one episode of deep vein thrombosis in temporal association with a slight increase in ACLA in one patient with preformed IgG ACLA , indicating that in individual patients the presence of autoantibodies may be associated with clinical pathology. Several hypotheses have been proposed which may explain, at least in part, how a (therapeutic) reduction in TNF activity could lead to formation of autoantibodies against nuclear components and phospholipids. One of these hypotheses relates to the activation of interferon (IFN)-α. Because, under normal circumstances, TNF downregulates IFN-α , it was hypothesized that the reduction in TNF unleashed IFN-α, thus fostering autoimmunity. However, in SLE, both IFN-α and TNF are highly increased and the levels of both of these cytokines are associated with disease activity [40–42, 44]. This finding not only challenges the hypothesis, but even suggests that the reciprocal negative regulation of the two cytokines is not functional in active SLE. Rather, the combined increase of both TNF and IFN-α might contribute to the pathogenesis of systemic autoimmunity. Another hypothesis relates to prolonged B-cell survival upon TNF inhibition. In a murine graft-versus-host disease system, TNF blockade led to diminished production of IFN-γ, diminished IFN-γ-induced CD95 (Fas) upregulation, and diminished cytolytic activity, but to a significant increase in anti-dsDNA antibodies . This led the authors to hypothesize that TNF blockade hampers the elimination of autoimmune B lymphocytes by cytotoxic T cells . Because IL-18, formerly called IFN-γ-inducing factor, is reduced by TNF blockade in RA as well as in SLE [51, 71], this mechanism may play a role. Chronic TNF exposure also directly impairs T-cell activation by downmodulating T-cell receptor (TCR) components, impairing TCR signalling, and attenuating antigen-driven events [72, 73]. Thus, inhibition of TNF may facilitate T-cell activation. Finally, TNF blockade after chronic TNF exposure may also lead to increased apoptosis . The resulting increase in apoptotic material could explain why the emerging antibodies appear to exclusively target nuclear antigens and phospholipids, both of which are expressed on apoptotic bodies [74, 75]. Thus, the combination of an increase in accessible antigen, normalization in TCR function, and better B-cell activation may help to explain the pathways to increased lupus autoantibodies under TNF blockade. In our limited experience, treatment with only four infusions of infliximab in combination with azathioprine or methotrexate appeared to be fairly safe with regard to lupus flares  despite the increase of autoantibodies . However, although it may hold true that the strong anti-inflammatory effects of infliximab protect against the transient increase in autoantibodies, occasional flares might well occur when more patients are treated. Looking at potential consequences of a likewise transient increase in ACLA, we have actually seen one (single) episode of deep vein thrombosis , alerting to such a possibility. On the other hand, we did observe bacterial infections. Even under short-term therapy (four infusions), we have seen a number of urinary tract infections, one leading to bacteremia, and an occasional episode of enteritis caused by Salmonella enteritidis . Longer-term therapy may in fact expose patients to higher risks in this respect . Infusion reactions were not seen when infliximab was combined with azathioprine (or methotrexate). Only a single episode occurred in a patient retreated 1.5 years after cessation of infliximab . This is likely due to the combination given that others have regularly observed severe infusion reactions in lupus arthritis patients for whom infliximab was used in monotherapy . These data indicate that short-term TNF blockade in combination with azathioprine may be a step forward in the therapy of patients with lupus nephritis. However, substantial evidence can be derived only from a controlled clinical trial. We recently embarked on a double-blind placebo-controlled study called 'TNF blockade with Remicade in Active Lupus nephritis class V', or TRIAL V. This study includes patients with membranous lupus nephritis (WHO class V) in whom corticosteroids and angiotensin-converting enzyme inhibitors have failed to reduce proteinuria below 3 g/day. Patients are randomly assigned either to the combination of azathioprine plus four infusions (5 mg/kg) of infliximab or to azathioprine monotherapy plus four placebo infusions (Figure 2). The primary endpoint is time to reduction in proteinuria below 1.5 g/day. 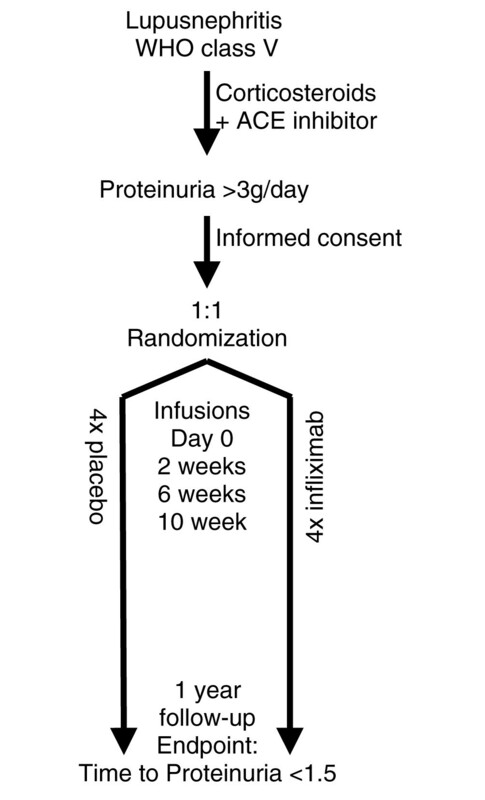 Graphic representation of the study plan of the ongoing TRIAL V (Tumor necrosis factor blockade with Remicade In Active Lupus nephritis class V) randomized placebo-controlled clinical trial. More details can be found at . ACE, angiotensin-converting enzyme; WHO, World Health Organization. Although our understanding of TNF in SLE has increased considerably over the past few years, novel findings are well in line with what had to be predicted from previous mouse studies. On the one hand, TNF apparently has anti-autoimmune effects and TNF blockade may lead to the occurrence of autoantibodies. Whereas drug-induced lupus-like disease is an uncommon, but established, adverse effect of TNF blockade in patients with RA, SpA, or CD, these autoantibodies hitherto have not induced lupus flares. On the other hand, TNF appears to play a major pro-inflammatory role in SLE also. The available open-label experience on infliximab therapy in SLE suggests that, in combination with azathioprine, infliximab may turn out to be an interesting therapeutic option in selected patients with SLE and in particular in those with nephritis. It will depend on controlled clinical trials to decide this point. At least one such trial is under way. Both authors have received a research grant from Centocor for laboratory studies and Centocor also funds the controlled trial. JSS has also received occasional advisory fees from Centocor and other companies marketing TNF blockers.